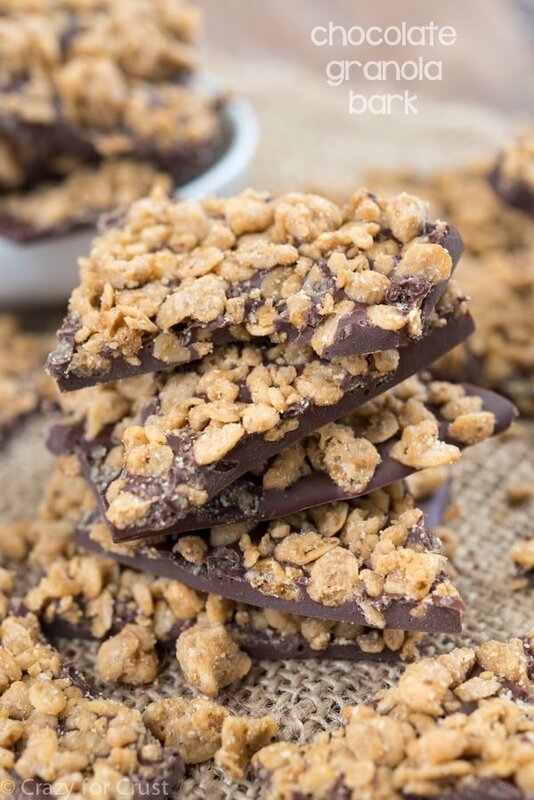 Easy Pie Crust Candy Bark – add some crunch to your next bark recipe by making it on top of a crunchy pie crust! This candy recipe is easy and fast and perfect to use up leftover Halloween candy. 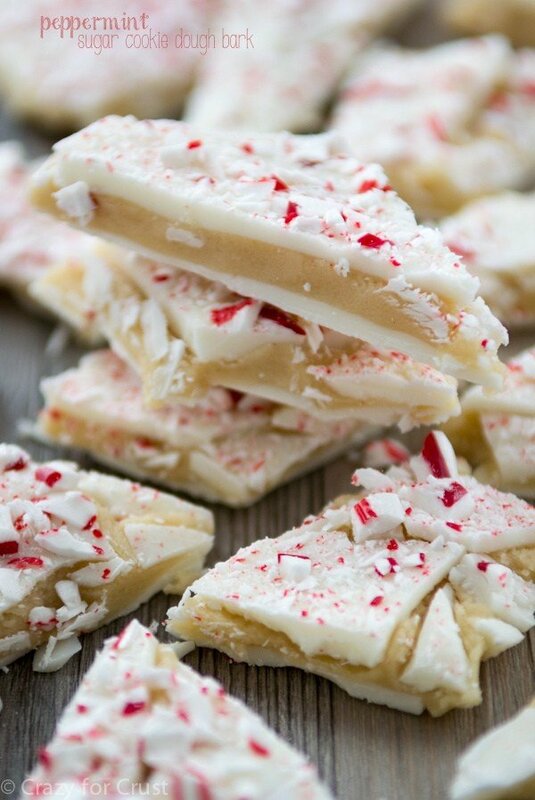 Candy bark is also the perfect Christmas candy, don’t you think? There are so many ways to make it but I love using the pie crust as a base because it adds tons of texture. Plus, all that candy! I have tried to write this post for days on end but I am pretty much brain dead and can’t think of anything to write. I feel jet-lagged…by life, lol. Last weekend I spend 4 glorious days in Breckenridge, Colorado. I’ll be sharing more about that in another post, but it was beyond gorgeous. I experienced my first ever snowfall which was hilarious (you can see the video here.) I also thought I was dying every time I walked up the stairs, walked, chewed, or talked (thank you, 10,000ft altitude). Then I came home for one day and went to a brand event in the Bay Area (2 hours from me). It was a super fun event for a grocery chain you’ve all heard of and I’ll talk more about that in a later post, but it was basically 24 hours of go-go-go with a 3 1/2 hour drive home in traffic. Today I’m brain dead. My head is fuzzy and I can’t focus. I couldn’t even concentrate on Real Housewives of New Jersey and you know if that’s the case something is wrong. Tomorrow night Jordan is performing at a HS football game then has a birthday party which requires 10:00pm pickup. Next week I leave for Michigan City for yet another work trip…the day after Halloween. 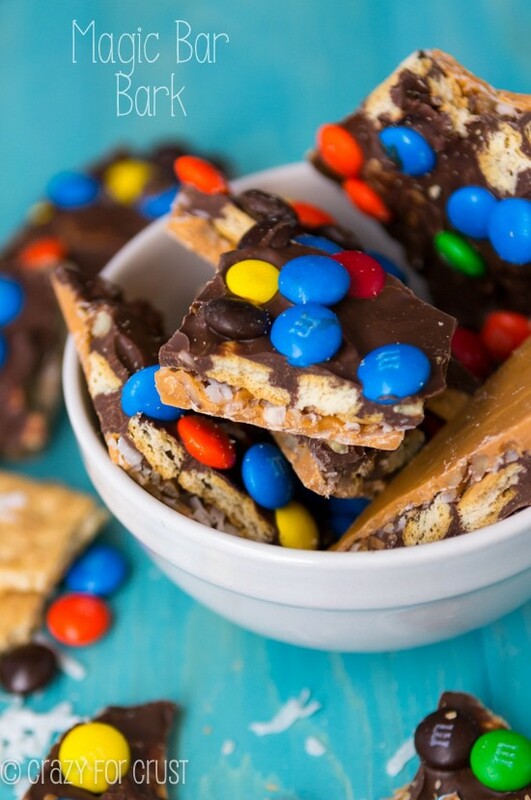 Good thing you can bookmark this recipe: Pie Crust Candy Bark is the perfect way to use up leftover Halloween candy and it doubles as a great Christmas gift! 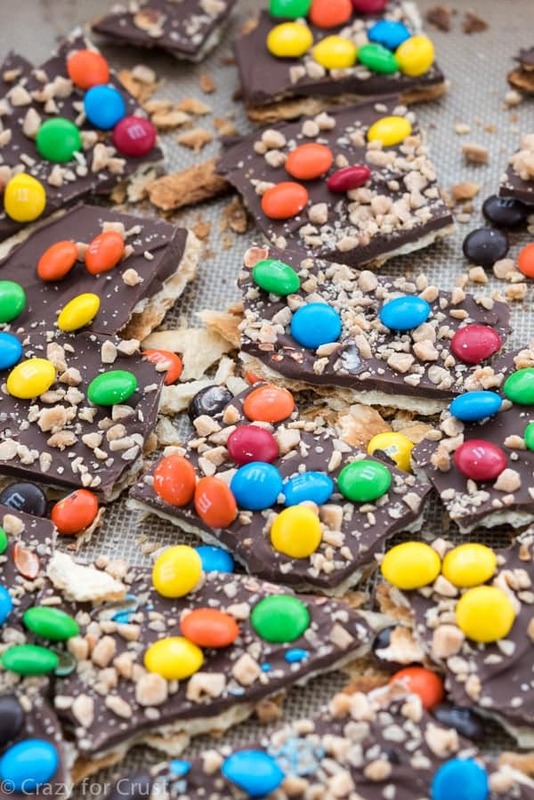 I’m sure you’ve seen the Halloween Candy Bark recipes on Pinterest, or maybe you’ve made my Halloween Toffee Bark. Chocolate bark in any form is the perfect way to use up candy or pantry items. As a baker, I have lots of open bags of chocolate chips and candies like M&Ms or toffee bits, chopped peanut butter cups or nuts. Making an easy bark recipe is the perfect way to use up all that leftover. When your kid totes home a huge bucket of candy and you can’t decide what to do with it, don’t sell it to the dentist. Turn it into a fun DIY kids project: Christmas gifts for the teachers, the postman, FedEx, and grandma! I love adding a crunchy element to my bark recipes, which is why I love using pie crust as my base. I’ve made bark candy with saltines before, or matzoh, but that’s usually toffee bark. You could totally toffee bark the heck out of pie crust bark, but this easy 15-minute recipe is better for those times you need a treat and FAST (and want the kids to help). Pie crust is baked until crunchy and spread with melted chocolate. Then you top it with your favorite candy and voila! 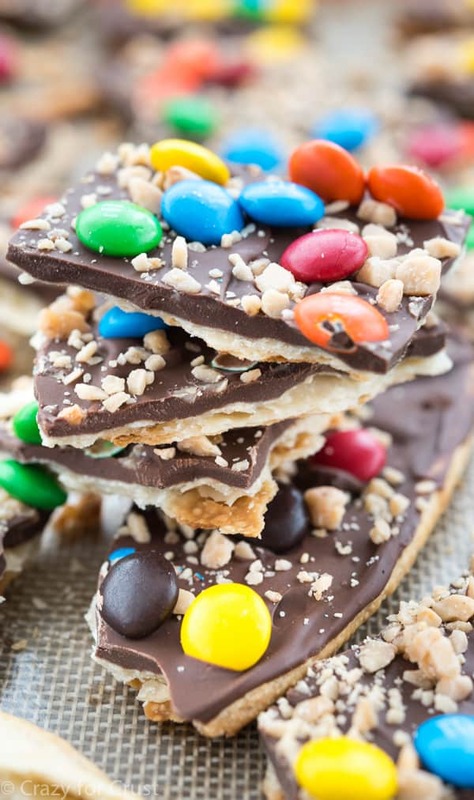 The best ever EASY Pie Crust Candy Bark! 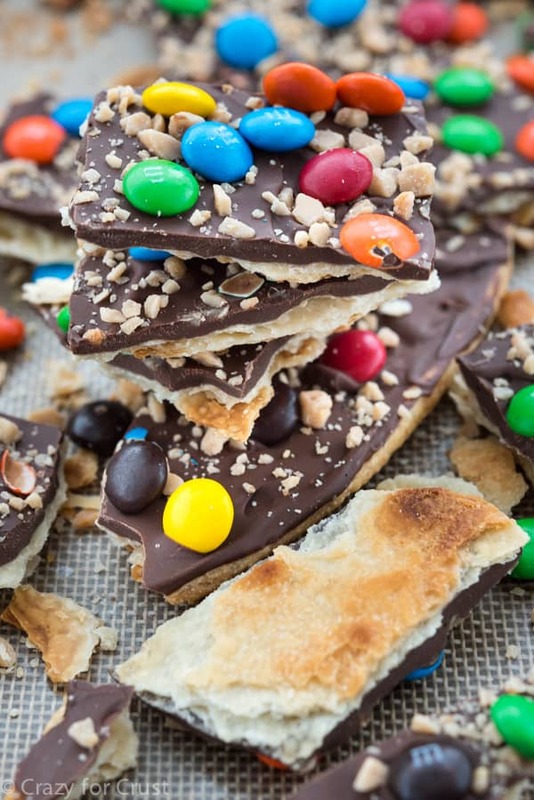 Make Pie Crust Candy Bark using leftover candy as an easy treat for the holidays! The crust does require baking, so even though bark is normally a no-bake recipe, this one isn’t. You bake the crust until it’s browned and crunchy, like when you’re making pie crust chips. You can use a refrigerated pie crust or make my homemade all butter pie crust to do this from scratch. Melt the chocolate in a bowl while the crust cools. I like to melt mine at 50% power in the microwave, stirring every 30-60 seconds. If the chips seem like they’re having trouble melting, add 1-2 teaspoons of vegetable oil, shortening, or coconut oil. Use any kind of candy you want! M&Ms in theme colors are super pretty and peanut butter cups are always a huge hit. This easy Pie Crust Bark recipe starts with a pie crust! It's baked until crispy, then topped with all your favorite candy bark ingredients: chocolate and candy! Preheat oven to 450°F. Line a cookie sheet with a silpat baking mat or parchment paper. Unroll pie crust and place on cookie sheet. Bake for 7-8 minutes until the edges just start to turn golden. Let the crust cool while you melt the chocolate. Place the chocolate chips in a microwave safe bowl and heat on medium power in 30 second increments, stirring between each, until melted and smooth. If they have trouble melting, add 1-2 teaspoons of vegetable oil, shortening, or coconut oil to the bowl. Spread the chocolate evenly over the pie crust then sprinkle with desired chopped candies or nuts. Chill to set, break into pieces and serve. Store in an airtight container in the refrigerator for up to 2 weeks. Great packaged as a gift! If you love candy bark you must try these sweets from some of my friends: Mint Oreo Bark by Wine & Glue, Cowboy Bark by Averie Cooks, or Homemade Butterfinger Bark by Crunchy Creamy Sweet. Don’t worry about RHONJ–they’re still fighting over the cake and Siggy is still being over-dramatic. First time I have seen pie crust used in bark–very creative! (and yummy). I love this idea and your work (and a little pleasure) travel schedule is INSANE! Just when I thought I was going to get through the afternoon without a sweet tooth attack. Not that I’m complaining.. this looks AMAZING! Need to try!